Great Ocean Road has been known as one of the MUST SEE list when it comes to Australia. According to wikipedia, the Great Ocean Road is an Australian National Heritage listed 243 kilometres stretch of road along the south-eastern coast of Australia between the Victorian cities of Torquay and Allansford. It is quite common that tourists do a self-driving tour from Melbourne to Sydney or vice versa, but you probably don’t know you can do it from Melbourne to Adelaide as well. I’m taking the direct flight from Kuala Lumpur to Melbourne by Malaysia Airlines, MH 149, departing Kuala Lumpur at 10.10pm and arriving in Melbourne Airport at around 07.50am, one of my favourite flight time that is perfect to start a day 1! Australia is 2 hours ahead of Malaysia so you won’t really feel any jet-lag. Arriving in Melbourne and getting into a cab to city which takes about 1.5 hours and cost around AUD$50, I checked in to Citadines on Bourke Melbourne, the place where I will be spending the first night. You can have a good walking tour around Melbourne just to chill on your first day in Melbourne! 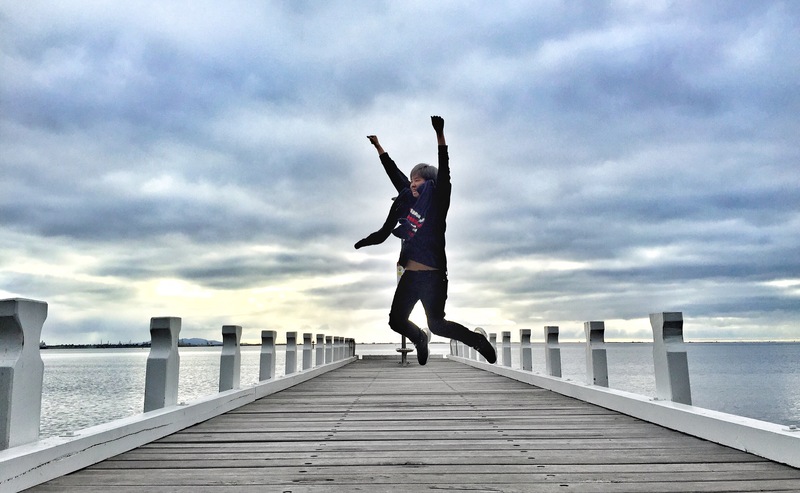 Check out what are the places you can do in One Day in Melbourne here. Departing from Melbourne to Geelong and spend a night at Anglesea *one of my favourite small town in this trip! It takes approximately 1.5 hours drive to get to Geelong, located on the shores of Port Philip Bay, Geelong is the gateway to the Bellarine Peninsula and also one of the ‘access’ to Great Ocean Road! Geelong has very stunning view of the waterfront and also along the street you may find interesting mural and artworks display on public. Before we moving on to Anglesea, approximately 20 minutes drive from Geelong is where you can enjoy Real Fresh Mussels at Advance Mussels Supply! Enjoy really good and home cooked mussels dishes and the best of it all is of course the Mussel Stout! Never heard of it? If you’re a stout drinker, Don’t Missed This! Do check out their website here for more information. Approximately 20 minutes drive you will find yourself at a stunning winery, besides winery is a restaurant with beautiful view where you can enjoy your lunch! Next stop after lunch is the Great Ocean Road Chocolatarie, it’s about an hour drive and you will get FREE chocolate tasting! There’s also a cafe inside the chocolatarie with lots of chocolate delight. Check out their website here for more information. The last stop for today is a small town name Anglesea, is also one of my favourite town with a really great resort! If you have time and money to spend, please do hop on the helicopter ride, a little tips for you who is going to take the ride, get there early if possible before 12pm so you will cut the group tour crowd ahead! The view that you will only get to see through aerial view from the helicopter. The drive is approximately one hour, so do plan your time ahead if you want to stop by Logans Beach Whale Watching Platform is where you may spot whales! Logans Beach is a natural whale nursey, almost every year between June and September, female Southern Right whales return to the waters of Warrnambool’s Logans Beach to calve. So bet your luck there but keep in mind if you want to see whales, it takes a lot of patience. Read more about The Twelve Apostles Helicopter Ride and Great Ocean Road here. Leaving Warrnambool to Mount Gambier is where we start the route to South Australia. First stop, is Mount Gambier town where you can see Blue Lake, the lake occupies one of the craters of the extinct volcano and early each November, the lake’s sombre blue, which is in evidence during the winter months, mysteriously changes to an intense deep turquoise blue almost overnight. The lake returns back to the sombre blue colouring starting late March. Another interesting place to visit at Mount Gambier is the Umpherston Sinkhole. You can check out more information about Mount Gambier here. Naracoorte Caves National Park is a place where you will learn about Fossil at Victoria Fossil Cave with a guided tour which will takes around 1 hour. It is also one of Australia’s World Heritage listed Conservation Parks, get to learn how dark it is when you’re inside the cave as the guide will run an interesting activity during the tour. =D Don’t be afraid, it’s nothing scary but it’s definitely an one of a kind experience. Robe is located on Guichen Bay, was once the third largest part in the State but is today more famous as a seaside destination for summer holiday. Visitors can drive along the 17km stretch of Long Beach and sail, surf or swim which makes Robe one of the popular summer holiday destination. Starting the day at Robe, make a drive to Camp Coorong, where we get to see a native museum by the Ngarrindjeri, we were told that every year they will received a group of students from Japan or other countries to come and stay at Camp Coorong to experience the Ngarrindjeri tradition. You can check out their website here if you’re keen to find out more about Camp Coorong. Strathalbyn is the place to soak up history, is a town with heritage buildings and you can take a rest and have your lunch at the town. Further up from Strathalbyn is Goolwa, Australia’s first Cittaslow Town. I tried one of the best whiskey in my life at Steam Exchange Brewery in Goolwa! I don’t know how to explain how good is the whiskey but if you get the chance to visit Steam Exchange Brewery, don’t forget to try their whiskey and their stout! Just a head up, this place is getting swarm of people during the summer time. The last stop of the day is Middleton, one of the best night I ever had for this trip is Beach Huts Middleton, I believe every girl will scream when they reach the place! Walking to the beach from Beach Huts Middleton is not very close but it’s definitely worth the walk as the sunset at the beach are just way to magnificent! The highlight of this self driving tour I would say is The Big Duck Tours – ‘Winter Whale Watching’ tour! I’ve been praying and wishing to see a whale for the whole driving trip and guess what, I finally get to see Humpback Whale with The Big Duck Tours! We get to see Dolphins, Seals, Seabirds and Humpback Whales! What a JACKPOT! The 6 day 5 nights tour ended at Adelaide, I get to spend a night at Adelaide and finally do my favourite activity – shopping at Adelaide Central Plaza! Other than Adelaide Central Plaza, there’s this full of historical market namely Adelaide Central Market. There is a tour run by Mark Gleeson, with this tour, you get to understand more about the market background and every family background of the stalls in the market, do check out their website if you’re interested to find out more about the tour. Next Post GoBear tells you BEST Credit Cards in Malaysia! Or the other way round is less busy! !